Fully embedded in mainstream CAD, no additional training is needed. Automatic 3D mesh generation, no user intervention and CAD conversion are needed. Comprehensive plastic material database (>5,000 grades) and friendly interface for setting molding parameters. Pioneering 3D technology for more accurate results rendering, smart animations and automatic HTML report generation. 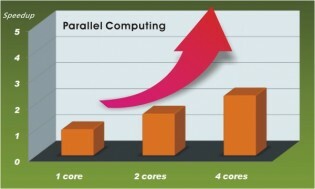 High performance 3D filling simulation supported by parallel computing up to 4 cores to do a quick part verification. Moldex3D eXplorer is a true 3D integrated tool for designers to perceive different part design and mold design options during early stage. Many designers are designing plastic parts with significant 3D characteristics and wall thickness variations by using 3D CAD software. In the past, they need to simplify the models into 2D before performing analysis. The simplification inevitably compromises analysis accuracy and often leads to significant errors. Moldex3D eXplorer seeks to provide a user-friendly interface for every CAD users to access Moldex3D's leading true 3D flow simulation results. With Moldex3D eXplorer, CAD users can easily setup analyses with only a few clicks in their familiar CAD environment. In other words, no additional training, CAD conversion or meshing job are needed. Moldex3D eXplorer is currently available in Creo Parametric, NX, SolidWorks, and Solid Edge. It will soon be available in most of the mainstream CAD software. 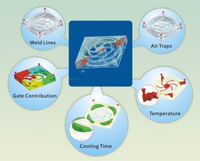 Moldex3D eXplorer supports parallel computing technology. 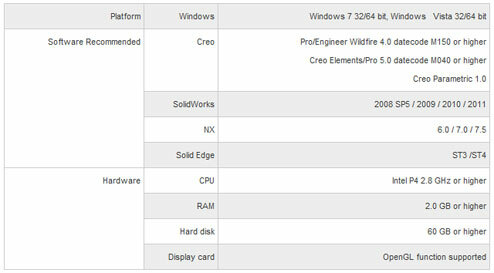 It is capable of reaching the maximum acceleration by fully utilizing each core of the modern CPU architecture (maximum 4 cores). After analyses are done, report generator then enables users to share reports with the product design team, clients, suppliers and the molders. Moldex3D eXplorer’s proprietary automatic meshing technology generates high quality 3D mesh automatically. No user intervention is needed! Moreover, designers can learn more about plastics and injection molding technology while the meshing engine is running. Moldex3D eXplorer ensures both originality and manufacturability in the design phase. Design teams can easily use Moldex3D eXplorer as a great assistance to figure out the potential problems and solutions in the CAD/CAM graphic environment. The seamless integration leads a way to optimizations for not only part designs, but also manufacturing process parameters. Critical quality issues such as air traps, weld lines, hesitations now can be easily simulated and observed for improvements in the beginning.